Journeys across Karnataka: What to see in and around Gulbarga city? 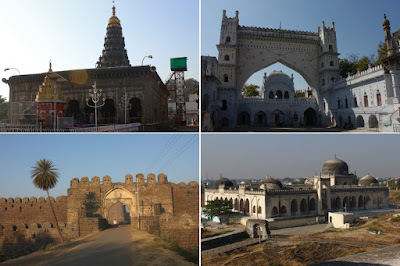 Gulbarga, now officially known as Kalburgi, was the capital city of Bahamani kingdom. The city is located on black soil plains and popular for 'Togari Bele' ~ toor-dal. Gulbarga is also known for its notorious summers, usually the highest temperature of Karnataka state is recorded here. When Bahamani's moved their capital from here to Bidar better weather was one of the motives. Gulbarga district along with Bidar, Raichur and Yadgiri was part of Nizam's kingdom. The city is marked with lot of ancient structures, may in two days one can visit all these spots. Sharanabasaveshwara Gudi - the most popular temple of the city dedicated to Saint Sharanabasaveshwara. It is located close to Gulbarga fort and Appana Kere. Within the temple premises is Sharanabasaveshwara Mahadasoha Peetha which manages several educational institutions. Appana Kere - This is the largest lake of the city, its situated right besides SB Temple. Gulbarga Kote - Gulbarga fort was originally built by Raja Gulchand. Later when Bahmani kingdom was formed, Gulbarga became the capital. Alauddin Bahmani strengthened the fort by adding a moat, increasing the rampart walls' height and constructing strategically placed bastions. Close to the entrance, within the fort is a massive turret with 3 cannons on it. Cannons can be found also on few other bastions. Less then 200 meters from the turret is Jamia Masjid. Jamia Masjid - situated within Gulbarga Fort, is said to be built on the lines of the Great Mosque of Córdoba in Spain. The structure is simple but has an interesting design. In plan it measures 216' x 176'; has a great arch over its only entrance facing North. The roof is covered with an array of domes; the largest dome is close to its western all, 4 big domes one at each corner and about 75 smaller domes arranged in a matrix. Overall the mosque is built in Persian architecture. The mosque's floor is glossy white; about 250 arches create a lovely maze; overall effect is a peaceful ambiance. 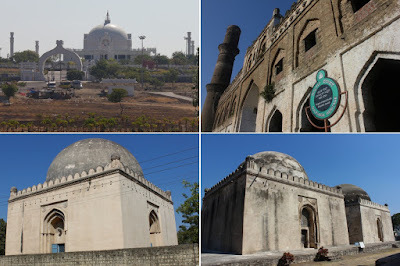 Khwaja Banda Nawaz Dargah - is the tomb of a famous Sufi Saint Syed Mohammad Gesu Daraz, popularly known as Kwaja Bande Nawaz who came to Gulbarga during the rule of Bahamani Sultan, Taj ud-Din Firuz Shah. The tomb complex is built in Indo-Saracenic style, has two large structures with large domes. Thousands of people from different religious communities participate in Dargah's annual fair. Haft Gumbaz - This is a necropolis of seven royal tombs belonging to members of Bahamani dynasty. Government Museum - The museum is housed in a pair of Gumbaz of Bahamani times. The artefacts include ancient Hindu sculptures brought in from different parts of Kalburgi district, cannons and household furniture and other items of the British agent Meadows Taylor. Sheik Rouza Dargah - this is the tomb of Hazarat Shiek Zunaidi. He was born in Peshawar in 1271 CE; came to Indi with Muhammad-bin-Tughluk; around 1330 CE during the rule of Muhammad Al Wali he came to Gulbarga where he was appointed as a courtier and served until his death in 1381. Buddha Vihar - was inaugurated in 2009. The centre is about 20 kms away from the fort. The spirit of a spiritual centre is truly kept up here by strict rules for visitors. People entering the campus have to take off shoes, must be dressed in simple attire, switch off phones, no photography and have to converse in low tones. Martur fort and Vijnaneshwara Bhavan - Vijnaneshwara was a prominent jurist of XII century. He authored Mitakshara, a legal treatise in Hindu law about property inheritance. Rules stated in Mitakshara have been adopted by courts. Jayateerth Matha on the banks of river Kagini near Malkhed - this is the 700 year old shrine Madhwa Saint Jayateertha. Haralayyana Paduke at Bijjanahalli - in this little village is a 800 year pair of shoes made for the XII Century Saint Basaveshwara. His disciple couple, Haralayya and his wife Kalyanamma, tanners by profession, cut their own skin and made the pair of shoes. The shoes was never worn by Basaveshwara out of respect, instead he returned it asking them to keep the divine pair. The ancient shoes somehow made it way to a family of Bijjanahalli. Samples of it were tested and proven it is human skin. Nagavi near Chittapur - a Hindu university existed at Nagavi several centuries ago. Now the place is complete ruins which includes Nagavi fort, Sanjeevini Hanuman temple, the 60 pillar temple, Yellamma temple and few other temples.